What was your inspiration and thought process to make I Was a Teenage Girl, Apparently? After Nina proposed that we collaborate on a project, we decided that I would come up with a story idea. I knew that I should try to come up with an idea that took advantage of the form—something that just couldn’t be done as live action, with a strong element of whimsy or imagined reality to it. At the time I had a few concepts that I had been working on in my writing, and one was about the gap between the expectations about my adult life that I had as a teenager, and my adult life as I was actually living it. I wrote a short piece about being visited by a teenaged version of myself, and having to explain/justify my life to her. I showed it to Nina, and she pointed out that there wasn’t really a story there yet. I struggled with it some more, and then somehow decided to try turning it around, and having the adult character revisit her teenaged self instead. I was able to incorporate my own recent experience of reading my teenage diary as an adult, being fascinated/appalled, and half-wishing for a do-over. And knowing that with animation we could show the adult character literally revisiting her teenage self was inspiring, too. So the story grew from there, and soon I wrote something that Nina liked and wanted to commit to as our story and script. What caused you to want to make short animation films? I have always loved animation, but I can’t draw. In my live-action filmmaking, I often explore the inner lives of characters, and I’m also drawn to absurdist or surreal ways of telling stories. And I like making very short films; many of my films are five minutes or shorter. So it seemed to me that my writing and directing impulses could be well-suited to short animation, where virtually anything you can imagine can be made to happen onscreen. Collaborating with Nina, a very talented animator and illustrator, is how I get to co-direct an animated film despite my complete lack of drawing ability. How did Lyn and Nina reconnect after 15 years? Did you call each other to meet, or just randomly run into each other? Nina “ran into” my film work, in a way. Nina was a judge for a grant I had applied for, and after the judging was finished and the artists’ identities were revealed, she discovered that one of the applicants whose films she had liked was me, Lyn Elliot from college! She emailed me, we caught up a bit, and I got to see and learn about the work she’d been doing in animation and illustration. (I had also admired Nina’s art work back in college, but from a distance, as we didn’t know each other very well.) 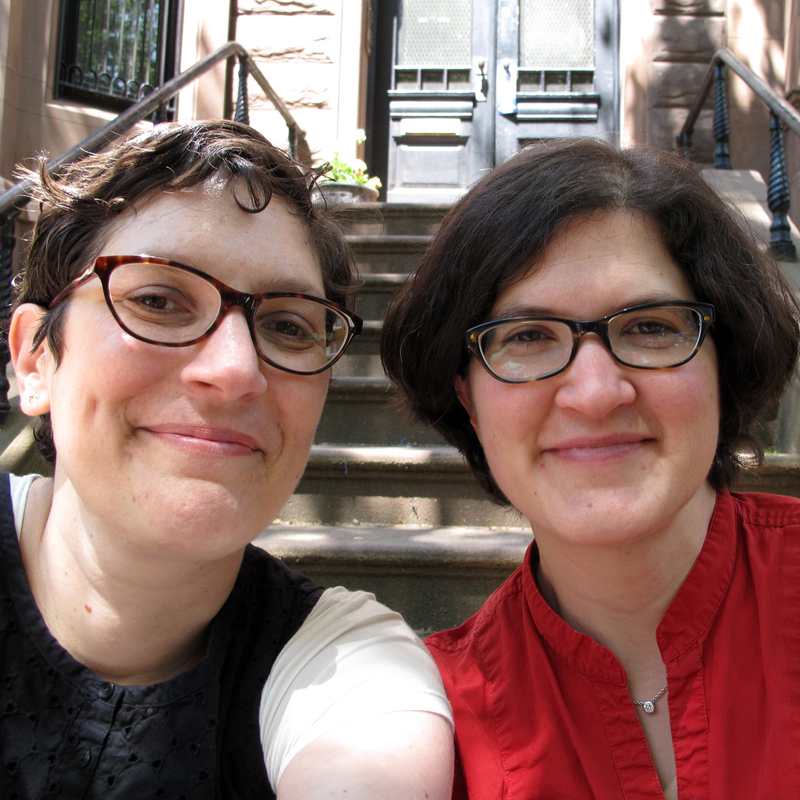 It turned out that Nina lived in Brooklyn near my sister, who I visited often, so it was relatively easy for Nina and I to get together, strike up a friendship, and, soon after, a collaboration. What is your favorite project completed? My current favorite is my last completed film, a live-action comedy short called A Good Match. But I know that when I Was a Teenaged Girl, Apparently is finished, it will be my favorite project completed. What is your favorite novel and genre? My favorite novel is Infinite Jest. Not sure about genre—is “literary fiction” a genre? I like memoirs and history, too. Are you working on any other projects while working on I Was a Teenage Girl Apparently? Yes– since this project has been slow and steady, we have both worked on other projects as well as taught full loads of college courses each semester. Lyn produced a great stop-motion animation while we were on a production hiatus. I have been working on developing a children’s book and have continued to do freelance animation/motion graphic and illustration jobs. Did you always want to be an animator/illustrator Nina? What inspired you to pursue this career? Pretty much always, although I didn’t know the name for it when I was younger– I thought it was called“Graphic Artist”. On my Mom’s side there is a strong family line of book-printers/designers, so I grew up with the idea that one can make art for clients and earn a living. I think that made a big impression on me, and so I jumped right in after college. My interest in characters, humor and story telling combined with my love of graphic-images first lead me to illustration. Then I learned how to make things move, and that seemed like a natural next step. What type of animation style is used? Why this particular animation style? “Tradigital” is the name of the style, and it’s a combination of traditional frame-by-frame animation drawing using a digital tool (Toon Boom Animate Pro 2). We chose this style because at first I wanted to do this traditionally and scan in all of the drawings. Once it became apparent that this was a bigger story with a lot of animation involved, Lyn and I discussed and explored programs that could combine the looseness of the drawn style with the efficiency of the computer. This was one part of the learning curve of our collaboration, and I think we are both happy with how it works to tell this story. How long did the planning of this animation take? How long did it take to finish? We began preliminary planning in 2009, and expect to have this wrapped up by early fall of 2014. In between we have worked through all sorts of life events, and taken some breaks. How was it like working with each other? Did you enjoy it? Why? Lyn and I both wanted to collaborate with each other to learn more about the other’s approach to making film and animation respectively, and I think we have both learned a lot, as well as made creative discoveries in the process. We Skype every week to check in and discuss the project’s progress, and we both have enjoyed seeing this come together like a giant puzzle. The project has evolved with us as we have evolved, and that is very rewarding.